Casa Leila - An adults-only, luxury, private villa to rent in Faro Park! 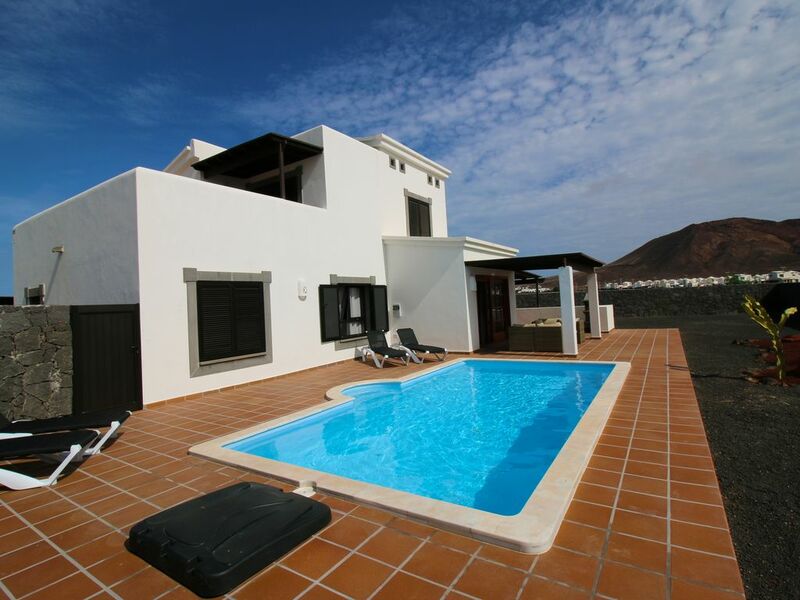 Casa Leila - A private luxury villa, available to rent in the upmarket Faro Park area of Playa Blanca! Less than 30 minutes drive from Lanzarote airport, 5 minutes drive from Playa Blanca town centre and 5 minutes walk from the sea front promenade which spans the coastline from the Lighthouse to the Marina Rubicon. Casa Leila is located within the upmarket Faro Park residential area of Playa Blanca, a quiet and peaceful place within a 5 minutes walk of a variety of local shops, restaurants, cafes and small bars. Enjoy spectacular views of the famous Montaña Roja, while you sit back, relax and enjoy a well-earned holiday. The main bedroom has a king-sized bed with memory foam mattress and the second bedroom has two single beds with memory foam mattresses. Both bedrooms have built-in wardrobes and shuttered windows, enabling the rooms to remain cool and provide a darkened sleeping area if required. Luxury Egyptian cotton bath towels are provided for guests' use. Beach towels are also provided. A private, heated, swimming pool is located to the rear of the house and is set in a private, walled garden. A key-operated safe is provided free-of-charge, to keep your valuables secure. Free WiFi. Free UK TV package provided (including BBC, ITV, sports and movie channels), together with a variety of international channels. There is a private parking spot to the front of the villa. Casa Leila has everything you require to make this a perfect 'home-from-home' in a peaceful and tranquil setting! IMPORTANT NOTE: The property is actually a three-bedroom property, however, one bedroom (the upstairs bedroom) is locked and not included within the rental. This has been reflected in the rental price, but guests still enjoy the benefits of a larger-than-average property and plot. The two bedrooms which are included in the rental are both located on the ground floor. The bathroom is also located on the ground floor. The upstairs consists of only the locked bedroom, therefore guests will have no access to the upstairs of the property. We have been regular visitors to Playa Blanca for over ten years and have family members living in the area. We love the all-year-round climate and the relaxed atmosphere. Having visited the area so many times, when we had the opportunity to purchase a holiday-home, it made sense for us to buy in Playa Blanca. Originally we were not planning to rent the villa, but we decided to do so in order to help with covering the costs. We hope you will enjoy it as much as we do! Our favourite part of Playa Blanca - Faro Park! Only 500 metres to the sea front and 500 metres to the various shops, bars and restaurants! Luxury private, heated, 8x4m pool. We have just spent 2 wks at Casa Leila,our first time there, and was not at all disappointed.It is a lovely villa with everything you could need for a comfortable self catering holiday. Very clean and good appliances. We have stayed at Faro Park once before, other side of the road across from the "parade" and it was fairly quiet but where Casa Leila is was extremely quiet which made for a wonderful relaxing holiday. The pool is brilliant and we made good use of it...very comfy sunloungers too. The glass screened outside eating area was great because no matter how windy it was it was always pleasant to eat outside as it was so sheltered. The TV package was the best weve ever had on a holiday so were able to watch a variety of programmes & films in the evening. Very comfortable bed with memory foam mattress..slept like logs! Didnt do much on this holiday other than walk & swim everyday.Most days we walked into Playa Blanca town..bussing back. We would definitely stay at Casa Leila again should we return to Lanzarote. We had to contact Steve the owner after a couple days due to problem with the water supply. He dealt with the issue promptly and kept us informed of what was happening and explained it was due to problem in that area which was resolved the next day. A lovely villa, a lovely holiday. This was my second stay at this villa and it was even better than the first. The owner has had glass installed down the side of the outdoor dining area and it has made a huge difference. Even in December on the coolest of nights, we have been able to eat our meals alfresco. The villa is tastefully decorated and is always fresh and spotlessly clean. Steve & Kerry take huge pride in keeping the property in tip top condition. Everything you could possibly need for a fabulous holiday is here. Thanks Steve & Kerry for sharing your second home with us. Beautiful villa in a Lovely tranquil area. Traditional Spanish. Italian. Indian. English. All very nice! Everything about our stay was perfect. After days out, we couldn't wait to get back to relax and swim in the pool. We would definitely return for a holiday here if it is still for rent. We had an amazing 10 day stay. The villa comfortably suits 4 adults, the pool is beautifully clean and a good size. Really appreciated the memory foam mattresses! Excellent location as it is quiet but still within easy driving distance of the rest of the island. Beautiful Villa in a lovely spot. Just back from a week in Steve's lovely villa. Great time. Property is excellent, everything you need for a great holiday. Have been in area a good few times and will definitely be back again. All dealings with owners very smooth friendly and professional. Recommend totally. The property is actually a three-bedroom property, however, one bedroom (upstairs) is locked and not included within the rental. This has been reflected in the price, but guests still enjoy the benefits of a larger-than-average property and plot.